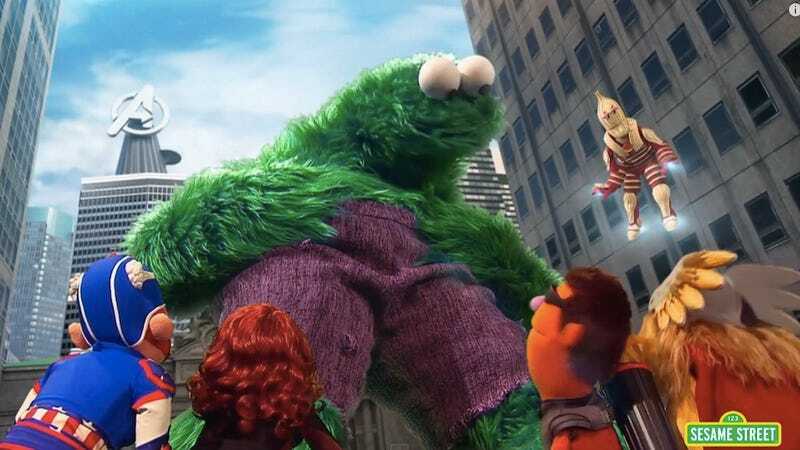 In an attempt to woo both kids and their TV-watching, Internet-surfing parents, Sesame Street does a lot of timely pop culture parodies, from a Grover-centric take on Game Of Thrones to “Star S’Mores,” which is exactly what it sounds like. The show’s latest, “The Aveggies: Age Of Bon Bon,” is especially smart, with Onion Man, Captain Americauliflower, Dr. Brownie, Black Bean Widow, Zuchin-Eye, and the Mighty Corn taking on the evil Bon Bon and his giant flying cookie ship. With tasty looking s’mores, cotton candy, and chocolate chips sprinkled throughout, the pro-veggie parody might not do the best job at getting viewing kids to eat their vegetables, but it’s smart and funny, especially for fans with a rough sense of Avengers lore. With swipes at both Captain Americauliflower’s vanity and Zuchin-eye’s uselessness, it’s packed with in jokes and adult-centric asides. There’s even a shawarma joke at the end.